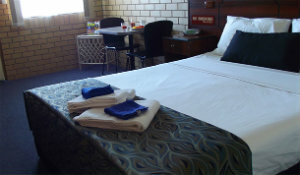 The Chermside Motor Inn offers clean spacious accommodation. Located in Brisbane’s northern suburbs, on the outbound side between Rode and Hamilton Roads, 400 meters from Westfield Shopping Centre. All our motel units have reverse cycle air-conditioning, fridge, HDTV, Microwave, toaster, Foxtel channels, all free-to-air channels, and both ground level and upper level rooms offer a quiet peaceful place to relax and unwind.